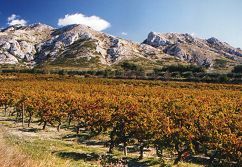 I was delighted to receive an invitation recently, to visit the tiny French Appellation of Les Baux de Provence, a rugged, windswept area that nestles to the west of the Alpilles mountain range in the Mediterranean south. The occasion was the annual “Fête Les Vignerons”, a wonderful celebration of local food and wine. Les Baux sits in a beautiful little corner of Provence at the mouth of the Rhône. 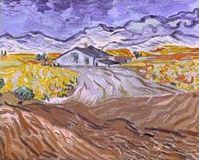 This is an area instantly familiar from the paintings of Cézanne and Van Gogh, where chalky white limestone outcrops on bauxite hills rise from a scrub-land of wild thyme and lavender, scattered with neat parcels of ancient vines and groves of olive trees (the mineral Bauxite, used in the production of aluminium, takes its name from the village). Visiting the area is easy for the UK wine lover, with low-cost airline Ryanair flying directly from London Stanstead to Nîmes, a pleasant one-hour drive away. Les Baux itself is a fascinating hilltop village, most of it dating from before the 16th century, some from the 10th century. The narrow village road climbs steeply from the car parking area, as you wander through labyrinthine streets, heading ever upward towards the ruined Citadel of Les Baux. On my visit the Mistral was blowing the proverbial gale, but Les Baux thankfully has several cafés and restaurants within its ancient walls, offering some respite. Les Baux is an area of polyculture, with almost all farms growing olives and bottling fine estate olive oils (also an AOC product), as well as producing other fruits and nuts. The unspoilt beauty of the area is quite uplifting, and the wine estates extend a warm welcome to visitors. Because this is a tiny appellation of only a dozen estates, it would be easy to think of it as a winemaking backwater. Indeed, the wines tend to display an element of rusticity, with a deal of grippy tannin and little truck with flattering, sweet new oak. For palates schooled on the reds of the New World, or modern Vins de Pays from the nearby region of the Languedoc, these wines might be accused of having a slightly old-fashioned character. But this style should not be confused with poor winemaking or lack of quality: over my few days of drinking these wines I began to appreciate these wines more and more for what they are: wines made to be drunk with food, where that suggestion of rusticity was transformed into a wonderfully supple, savoury appealing wines, including some of profound quality. But there are changes afoot too, which depending on your point of view, might worry or delight you. The producers of Les Baux have kept a watchful eye on their neighbours in the south, where plantings of “international” varieties are increasing rapidly, especially Syrah. 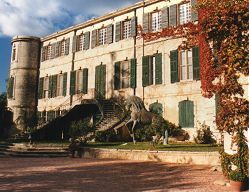 In some of the estates – Château d’Estoublon and Mas Sainte Berthe for example – the cellars have acquired new oak barrels. The traditional foudres – large, old-wood vats – are still employed almost universally, but barrique fermentation, lees-stirring, and all the techniques of modern fine-wine making are gradually gaining ground. 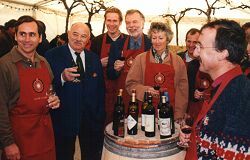 Special cuvées, both red and white, are being produced which are much more international in character, to sit alongside more traditional styles. The barrel-fermented Coin-Caché white and red of Mas de la Dame (with help from consultant oenologist Jean-Luc Columbo), or the Cuvée Louis David from Mas Sainte-Berthe, are examples of deluxe bottlings that are aiming for a premium position and more international market. Visiting the dozen estates of the region can easily be done in a couple of days by car. Making appointments is recommended, as not all estates have official visitor centres, and invariably it will be the winemaker who will greet you, or some other important member of the workforce. One estate that is well set-up to receive visitors is also one of the most stunning: the biodynamic estate of Château Romanin. Romanin’s cellars are carved deep into the rock face, a wonderfully atmospheric cave, where the story of bio-dynamic winemaking is told via displays around the walls and vats of maturing wine. There is a large, modern visitor’s centre, shop and tasting bar. Drop-in visitors are welcomed. Much work is going on in nearby Château d’Estoublon, where new owners the Schneider family are restoring both the 14th century house, and vineyard holdings. Estoublon is renowned for its olive oil, but now under the direction of Rèmy Reboul there is equal emphasis on regaining a once considerable reputation for wine. Eloi Dürbach of Domaine de Trévallon is a consultant. It is interesting that Trévallon, though without doubt the biggest name of this tiny enclave, produces his wines under the humble Vin de Pays appellation. The reason? He has refused to plant Grenache Noir in favour of the Cabernet and Syrah that make up his famous red blend, so does not qualify for AOC status. Les Baux is fascinating little microcosm of the world of winemaking into the 21st century, where age-old traditions and methods are being forced to rub-shoulders with new thinking and technology. Whilst some areas – great swathes of the Languedoc for example – seem to have gone hell for leather after modernisation, it is, and will be, fascinating to observe the development of the wines from this tiny, relatively isolated region. All the signs from my visit show that there is wonderful quality in the vineyards here, and a group of like-minded and dedicated winemakers who are trying, perhaps even struggling, to accept the need for change, whilst preserving the very real qualities of their traditions. The winemaker here is Christian Nieff, who originally plied his trade in Burgundy. The estate has been replacing Carignan and Grenache with Syrah and Cabernet Sauvignon. Winemaking is organic, and barrels are used for some cuvées. Mostly Grenache Blanc, this is very clean and crisp, with a touch of honey over sweet pear and herbal fruit. Nice palate, which is quite full and plump, with good fruit and a little rounding-out with sweet oak in the finish. Very good. 60% Grenache, and 20% each of Syrah and Cabernet Sauvignon. A good, clear, well-defined cherry and bright raspberry fruit character. Hints of jammy ripeness. Nice savoury palate, with hints of black olive and lots of juicy acidity, as well as drying, damson-skin fruit, black plum and plenty of serious tannic structure. Good length, and very good indeed. Part fermented in new wood, this has a nicely-weighted hint of toast and vanilla over solid, ripe, juicy blackcurrant and mulberry fruit. Lovely savoury quality on the palate again, with a fine fruit quality and plenty of structure from ripe tannins and good acidity. Holds up well into a long, pure, concentrated finish. Balanced, and very good indeed. The charming Noel Michelin is president of the biological winemaking association, and runs a very traditional cellar, with tank fermentation and hand-remontage, egg-white fining and only short periods of oak ageing for the top wines. Tasting his 1990 Cuvée Aurelia was a highlight, and shows how well these wines age. UK stockists include Vinceremos (0113 244 0002) and Vintage Roots (0800 980 4992). Clean, pure, zippy pear fruit; lots of crunch and juicy freshness. The palate has good weight, and is bursting with juicy, ripe grape and pear fruit and lovely balance. Very good indeed. Rich melon fruit on the nose; deep, ripe ogen melon. This is powerful stuff, with a big, sweet and very rich palate. Uncompromising and full-bodied, but bags of fruit and character. Very good/very good indeed. 50% Grenache, 25% each of Counois and Mourvèdre. Again a lovely fruit sweetness on the nose, with crisp strawberry, straw and herbs, and again a hint of melon. The palate is very juicy, with bracing acidity but shot through with a nice quality of red fruits. First of a mini vertical of this Grenache, Cabernet Sauvignon and Syrah blend which sees no oak. Bright cherry fruit, with a raspberry juiciness and deeper hints of plum and blackcurrant. On the palate the fruit quality is very deep and silky, imbued with fine, sweet, almost overripe black fruit and velvety tannins. Drying and very powerful, but no over-extraction. Very good indeed. Same wine from previous vintage. A blend of Grenache, Cabernet Sauvignon and Syrah. Deep, sweet, cherry fruit on the nose with a lovely creamy density. Full-bodied, the palate has lots of creamy ripe-fruit weight, powerful, solid tannic grip, and a real mass of pure fruit into the finish. Very good indeed. Almost some eucalyptus on the nose here, with deep, concentrated, creamy black fruit with a little hint of almond. The palate is juicy and beautifully poised between youthful sweet fruit, and a savoury, bittersweet black plum, leather and cherry acidity. Gorgeous and very good indeed. Sweet, deeply-hued fruit with little hints of garrigue. Vibrant and deep on the nose. Palate has plum, leather and hints of raspberry brightness, with plenty of meaty tannin. Pleasantly rustic, this has terrific quality and is crying out for a juicy steak. Very good indeed. The top wine of the estate, which is aged in American and French oak barriques for twelve months. Deep animal scents; lots of game, leather and notes of violet and mint, real floral highlights with dark cherry, earth and bracken qualities. Complex and pretty sensational. Flooded with dense red fruits on the palate, this has retained plenty of sweetness after twelve years, with pepper and black fruit running alongside spice and elegant, tight tannins. beautifully balanced and quite Côte-Rôtie-like in a way. Excellent. I have a bottle of the 1998 for opening in another 10 years! Vineyards cover 38 hectares of this estate. Reds are aged in oak barriques, and farming is biological. The estate recommends cellaring the red for at least five, and preferably 10 years. Clean, crisp, pear and star-fruit aromas, with hints of apricot. Good quality of clean, quite opulent fruit and a lovely sense of purity and generosity into the finish, with good acidity but a rounded length. Very good/very good indeed. This has a charming, slightly rustic bracken and woodland, berry-fruited nose. Very solid fruit quality going on to the palate, which is chewy and densely textured, with a fine quality of juicy black fruit. Lovely sense of dry, savoury, plum-skin fruit into the finish. Good length. Very good/very good indeed. Adds some sweet, spicy, slightly coffee-ish oak to the picture of clean, tight black fruit. On the palate medium-bodied with a lovely silky texture. Good quality here, with drying tannins quite dominant, but serious, structured stuff with fine tannin and acid balance. Very good indeed. This wine is 80% Rolle, and 20% Clairette. It is fragrant and spicy, with notes of flowers, herbs, pepper and clove. It has a rounded, rich mouth-feel and has an almost oily texture, but is also very crisp, with punchy orange and grapefruit flavours and a long citrus finish. Very good/very good indeed. 45% Sémillon and 55% Clairette. This barrel-fermented wine has a rich, rounded, vanillin nose which is very nutty along with small notes of butter, peach and lemon. On the palate it is rich and oily, with plenty of fleshy, ripe fruit and the spiciness of the oak filling out the finish. Very impressive stuff, with good balance. Very good indeed. Vibrant deep crimson/black. Very ripe, dark, cassis and blackcurrant nose with a little background pillow of oak. The palate is dry, with big drying tannins and robust. powerful fruit. It has good length and balance, and has a forceful purity in the finish, with plenty of fruit. Very good indeed. Very opaque and dark. Liquorice and solid black fruit on the nose, with a creaminess. The palate is inky and filled with bittersweet blue/black fruit, some plummy depth and thick, mouth-coating tannins. Good acidity, this is long, saturated and very dry. Too dry? Very good. Sumptuous nose, with sweet, ripe, glossy blackcurrant pastille fruit. Very deep and sensuous stuff, with damson darkness. The palate is quite grippy, with a slight toughness of leathery density, but then that sweetness of fruit punches through and this ends with fine balance, purity and length. Needs time, but very good indeed. Importer is the Wicklour Wine Company, Wicklour, Ireland (00 3534 046 6767). These wines blend Grenache, Syrah and Cabernet Sauvignon, and are aged in foudres, though these are new and do give a little new-oak quality. This has a nicely earthy nose, with hints of mineral and damp woodland. There is a core of black fruit and raspberry that continues onto the palate. Juicy, with a nice sense of bittersweetness and a plummy edge into a long finish. Very good. More smoky, vanillin quality here over a core of rich blackcurranty fruit. The palate is ripe and creamy, with a generous weight of fruit, nice sweet tannins and a smooth texture. There’s a hint of liquorice into a long, balanced finish. Very good indeed. Dominque Hauvette (right) is an ex-lawyer turned winemaker, and a pretty uncompromising character. Her wines are very good, and certainly come under the heading of “micro-production”, with just six hectares of vines. She also makes a 100% Counois, which I had with a lunch, and which was also lovely stuff. Reds only are given some time in wood. Available from La Vigneronne (0207 589 6113) wineandco.com. Lots of new oak here, very toasty, with a coconut and coffee-bean quality over slightly herbal pear and spiced apple fruit. There’s a straw-like, herbal quality on the palate too, and a sense of mineral acidity before that oaky spiciness reasserts itself. A touch over-oaked. Good. Clean, bright nose, with much less oak apparent than on the white, and a schisty, mineral quality over solid, sweet black fruit and a hint of olive. The juicy fruit is constrained on the palate by drying tannins, and though some rounding spice and vanilla supports the finish, this is balanced and long. Very good. There’s a bright cherry and strawberry quality to the nose of this; very vibrant and juicy – almost blackcurrant jammy. On the palate it is much drier, with dusty tannins and a silky texture. There is a finely-wrought fruit quality and good length. Balanced and very classy. Very good indeed. Run by brothers Luc and Frédéric Cartier, this estate has been in the same family hands for generations. Their grandfather planted the first vineyards, and Luc and Frédeéric have been making the wine since 1975. UK Agents are Haughton Agencies (01502 727288). This has a very clean, crisp, pear-drop nose with notes of straw and a little hint of flowers. Modest, yet juicy, crisp apple and melon fruit on the palate. Clean and appetising, and well made. Lots of sweet, nutty oak with little notes of orange and spice. There is a fine, ripe peach and pear quality on the palate, with nutty nuances. It is rich and the weight is bolstered by integrated spicy oak. Long and very good. Lots of creamy, silky, ripe fruit quality here; like strawberries and cream with a little tart cherry edge. The palate is quite dry, with very dusty tannins and perhaps smothering the promise of the fruit slightly. Good. Again that wonderfully creamy quality of rich, ripe, summer berry fruit, but now a hint of pepper and more depth; even a chocolate note. The palate has much more concentrated and deep damsony fruit, with fine tannic support and juicy acidity into a long, balanced finish. A real star, and excellent. A lovely old Château with beautiful cellars, where new owners the Schneider family are working closely with Eloi Dürbach of Domaine de Trévallon as consultant. An extensive producer of top olive oils, the vineyards have decreased in area of the years, but now winemaker Rémy Reboul-Schneider (right) is planning to expand. There is obvious investment in both vineyards and cellars. One to watch. Heavily-wooded, with a new-sawn oak, coconut and spice nose layered over quite stylish pear and sweet apple fruit. There’s a nice crispness on the palate, which is less dominated by the wood, with plenty of gently honeyed orchard fruit and a background, warming weight of oak. Good balance, and very good. Lots of attractive, earthy, autumnal berry fruit here, with a smoky oak quality and good ripeness. On the palate this is dry and stylish, with really ripe, sweet, forward fruit and fine purity. Soft tannins and acidity do enough to balance, and there is good length. Very good. Barrel aged, quite serious stuff. Fascinating rose-hip and strawberry fruit over an earthy, quite truffly character. Earthy palate too, with a crisp fruit quality pushing through and plenty of zippy raspberry acidity. Unusual and very good. Very nice sense of earthy, schisty, mineral character here. Plenty of cherry fruit. Palate has warm berry fruit, with a juicy undertow of pepper and blackcurrant. Lots of richness and ripeness here, but again good, savoury finesse. Very good indeed. Architecturally stunning, the cave is hewn from the rock-face in this biodynamic estate, which educates in the theories of biodynamism through cellar tours and displays. It is a very large estate for the region, and is well set up for visitors. Winemaker Jean-Louis Andrieux (right) explains that all harvesting is by hand, done in the evening for cool conditions. UK Agent is Wigglesworth Wines (01435 813740) and stockists include Vintage Roots (0800 980 4992). Delicate, lightly nutty, with almonds and herbal aromatics over orchard fruit. Quite punchy on the palate, with a definite spiciness, apple and pear-skin flavours, and a long, powerful finish. Very good. La Chapelle is the Château’s less expensive range of wines. A certain cedary quality to rich fruit that is creamy and bright (a little carbonic maceration maybe?). There’s a jammy quality about the fruit on the palate, with quite dry tannins and a moderate finish. Very good. First of a little four-vintage vertical. Lovely nose, with little animal notes and a touch of gamy bloodiness over bold, briary, peppery, plum and cherry fruit. Ripe and sweet on the palate, there’s a liquoricy core of bittersweet fruit, and a gain a creaminess pushes through into a long, balanced finish. Very good indeed. Deep and quite closed at present. Some black plum and mulberry aromas are lurking in there, with pepper and a bitter chocolate note. The palate is very concentrated, with thick, firm tannins dominating at present, over a serious depth of black fruit. This seems most impressive, but it will be a while before it emerges from that cloak of inky tannins. Very good indeed, possibly excellent. Bold, peppery fruit with little gamy notes and hints of spice and thyme. The palate has a fine weight and again tannins are dominating, flooding over the tongue, but the fruit is good and concentrated, and this is balanced, with a slightly more forward character than the 1998, and lovely finesse. Very good indeed. Lots of syrah-like charcoally quality here, with raspberry and redcurrant notes over sweet plum and blackcurrant. Massive tannic dryness on the palate, coating the tongue but the fruit quality shows through with very promising, pure black fruit and fine length. Clean finish and well-balanced by good acidity, this has the potential to be excellent. Finally, a little tasting of this wine that sells for a modest 20€ at the Château. Nice animal rusticity, with earth, leather and a touch of game over juicy cherry fruit on the palate and good balance.